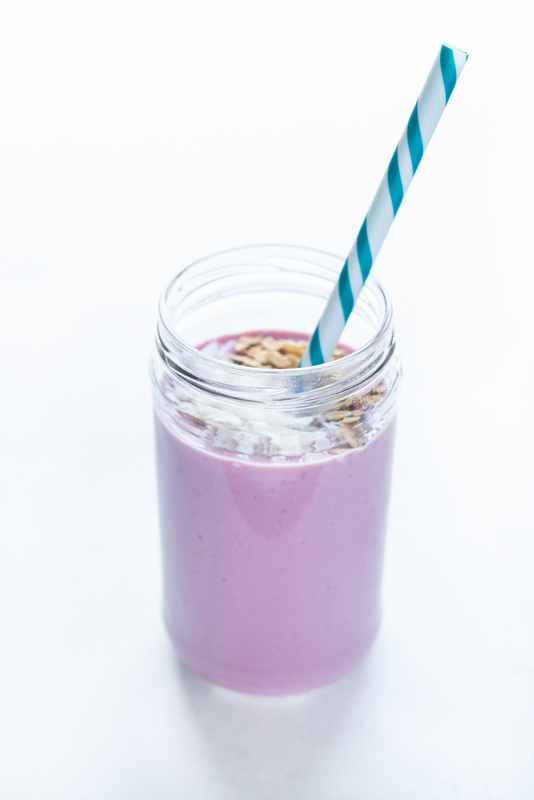 This Purple Sweet Potato Smoothie looks (and tastes) like a raspberry milkshake – but is packed with fill-you-up fiber, slow-digesting carbohydrates, protein, and antioxidants to fuel even your busiest days! The perfect recipe to enjoy before hitting the gym or as a quick & easy breakfast in the morning. I have been DYING to get this recipe posted to the blog for sooo many moons, my friends! This is the “unicorn” smoothie that you might’ve seen me making in my instastories over the past few weeks. I’ve been sippin’ it on repeat lately and can’t seem to get enough of this simple, healthy smoothie recipe. 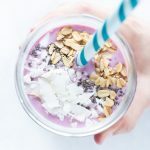 The bright pink and purple hue always puts me in a good mood and it tastes like a sweet, creamy, berry milkshake – without any refined sugar in the mix. And I LOVE getting an extra serving of veggies into my day without having to even think twice about it. While I love all-fruit smoothies, they tend to leave me feeling hungry again in no time flat. The carbohydrates in fruit alone don’t seem to make a lasting impact on my hunger levels. And I don’t know about you, but if I’m going to enjoy a smoothie as a meal (like to fuel up before a heavy workout or as breakfast first thing in the morning), I want it to fill me up and leave me feeling satisfied long after the last sip. Sadly, a fruit-only smoothie situation just doesn’t fit that criteria for me. Smoothies with both fruits and vegetables tend to keep you feeling fuller, longer. So do smoothies with a good amount of protein and healthy fats in them. 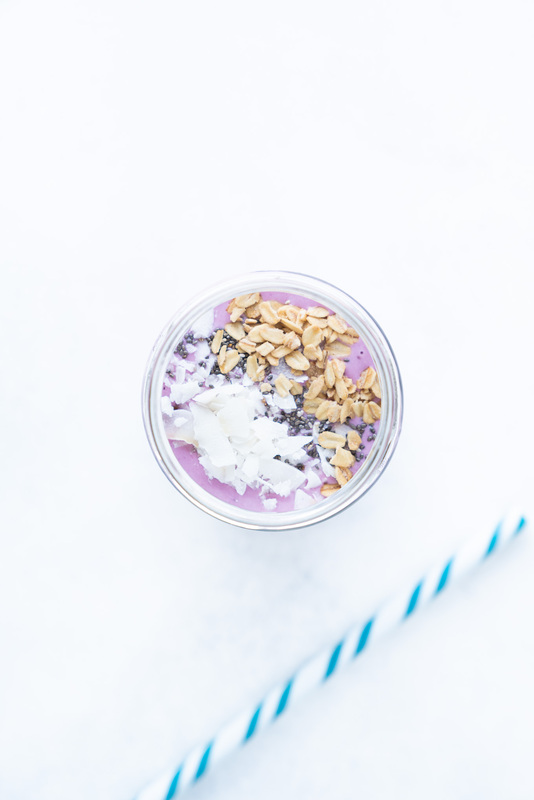 Thanks to Greek yogurt and the (optional) scoop of collagen peptides mixed in, this smoothie boasts 35+ grams of protein. Which is more than my usual breakfast of scrambled eggs + oatmeal even tops out at. If you want to keep this recipe vegetarian-friendly, then you can leave the collagen out (or you could experiment with adding a vanilla whey protein powder instead if you wanted to keep the protein content high). I’ve been trying to add more veggies into my usual line-up of smoothie ingredients – especially flavor-neutral ones like cauliflower, butternut squash, zucchini, spinach, kale, carrots, and sweet potato. They are filled with fiber and add even greater nutrient diversity into each sip. When frozen, they add even more texture to your smoothie (so you don’t have to water down the taste with extra ice just to get it to that thick consistency you like). The other reason I have been so pumped about tossing more veggies in my blender lately is because it lowers the sugar content of your smoothies considerably. Everybody (as in every BODY) processes sugar differently. Some metabolize it easily with no disruption of their mood or energy levels, and others (like me!) don’t process it so well. 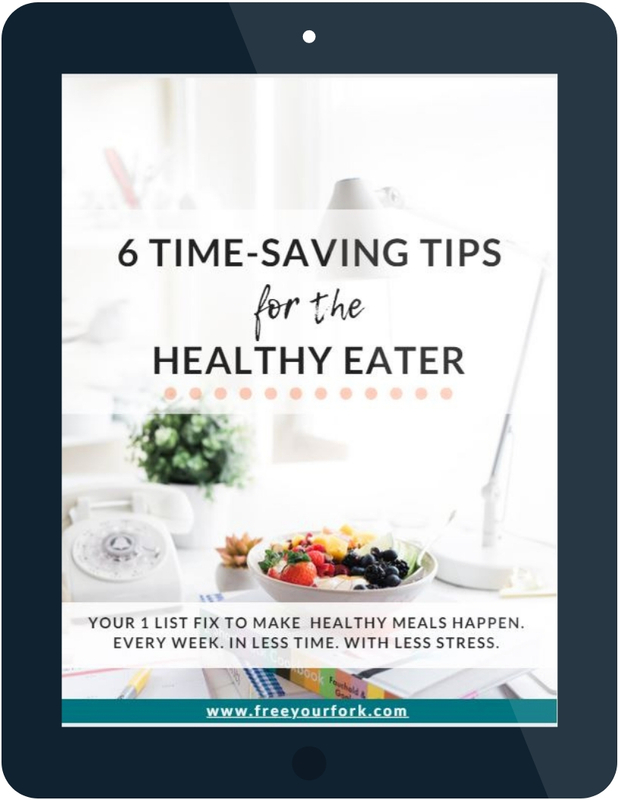 Diabetes runs in my family and in Billy’s family too, so in our house we have to be a little more cautious about how much we’re taking in every day. That’s why you’ll see me use stevia as my sweetener of choice in a lot of recipes. I like using it because it keeps the sugar content in this recipe low. Sometimes I opt to use liquid vanilla stevia drops (I like the alcohol-free kind) and other times I will use the less-processed stevia concentrate (which I prefer in teas not smoothies, because it has a bit of an herby taste to it). Stevia satisfies my sweet tooth and gives me that sweet flavor I love, without the energy highs and lows that sugar tends to bring me. But I realize that not everyone is as jazzed about using stevia as I am. Some are offput by the taste (it’s active compounds can have up to 150 times the sweetness of sugar, so using too much of it in a dish can create a bitter taste). Some just prefer to trust in the natural sweeteners that they know and love sweeteners (like honey, maple syrup, agave, coconut nectar, pitted dates, etc). 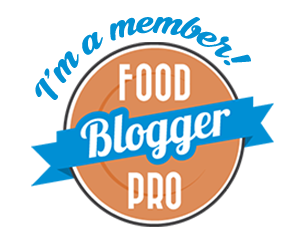 I still use all of these in moderation quite often, and you can rest assured that they will work great in this recipe in place of the stevia. Don’t forget that this is YOUR SMOOTHIE. If you prefer using something else – by all means, go for it! Swap out ingredients you don’t like for things you love to eat and don’t be afraid to play with the quantities to suit your taste. 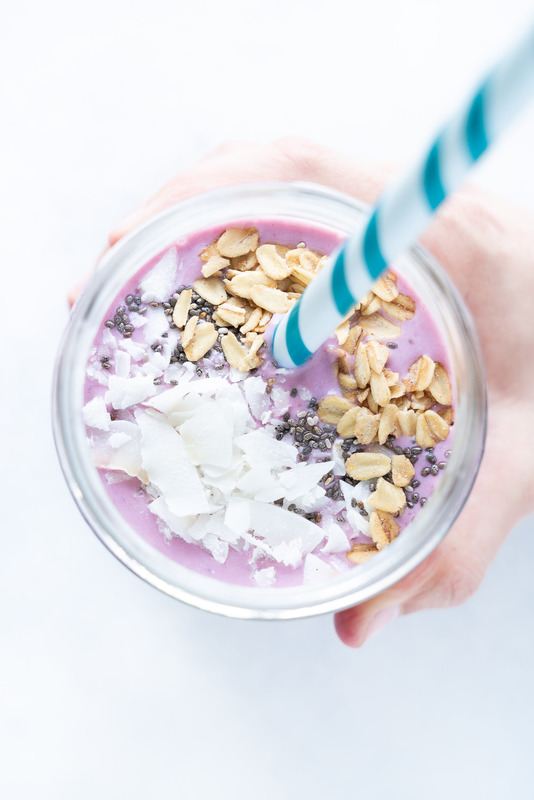 For example…if you want a thicker smoothie – cut down the amount of almond milk to 1/2 c – 3/4 c. If you want it more drinkable, then add even more milk than just the single cup. If you want to just try adding some sweet potato in but aren’t 100% sure about it, then add more frozen berries and a little less of the sweet potatoes if that feels more your speed. If it tastes like it needs a little more zip instead of creamy sweetness, then add in more lemon juice for tartness to balance it all out. Recipes are just guidelines – use them to experiment. And remember that unless you’re trying to bake a cake or a loaf of bread (where more precise measurements are needed) you don’t have to follow exact instructions and ingredient lists. This recipe owes it’s punchy color to a combination of raspberries and purple sweet potatoes. So if you want to get this same color, then I would recommend sticking to those two ingredients. But if you just want to go for a similar taste then they are potentially interchangeable with other berries and other sweet potatoes. If you want to, you can absolutely use orange or white sweet potatoes in place of the purple ones. To me, the purple sweet potatoes taste pretty similar to their orange and white counterparts. But while they don’t taste hugely different, the purple potatoes do have a slightly different nutrient profile. 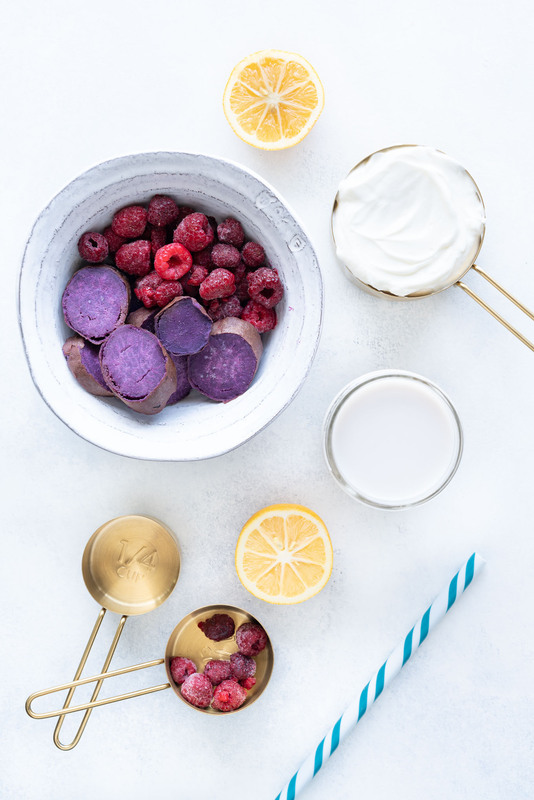 Their signature color isn’t just beautiful, it also means that they are filled with antioxidants (just like blueberries and other blue or purple hued produce). They’re also naturally denser than the orange variety of sweet potato, meaning they need to be roasted at a slightly lower temperature for a slightly longer amount of time. About 25 degrees lower, and 30 min slower to be exact. While this recipe isn’t about how to roast sweet potatoes and I haven’t accounted for the roasting and freezing time in the recipe card – I did tuck some extra directions in the “notes” section for anyone who needs a little cheat-sheet or refresher. You’ll see roasting directions for these purple beauties, as well as directions for orange & white sweet potatoes. So whichever variety you choose, I’ve got you covered! The great thing about smoothies is that they come together QUICKLY. Like ready in a matter of minutes from start to finish. So my biggest tip for you if you want to use sweet potato in your smoothies throughout the week, is to prep your sweet potatoes ahead of time. Roast up several sweet potatoes (I usually do 3-5 at a time), chop them up, and store them in freezer-friendly bags to use in smoothies for weeks or even months later. While you can sometimes purchase already cubed and frozen sweet potato from the store, they won’t be quite as sweet if you don’t roast them – the roasting process coaxes out the natural sweetness in them and caramelizes the naturally occurring sugars. Also, you may find that your stomach might be more sensitive to an uncooked starchy vegetable. For instance, some people who add cauliflower to their smoothies like to steam it before freezing it. And while raw cauliflower doesn’t bother my digestive system one bit, if you are experiencing any bloating or discomfort after having a veggie-packed smoothie – consider steaming it (or roasting it) before freezing it. And see if that helps you digest it more easily. Have you tried adding some vegetables in with your fruit smoothies? Tell me what your fave smoothie ingredient is in the comments! 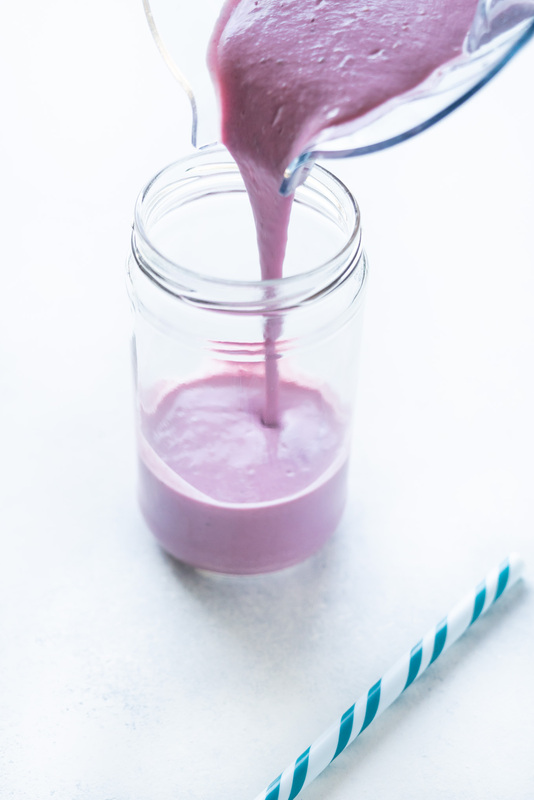 This Purple Sweet Potato Smoothie looks (and tastes) like a raspberry milkshake, but is packed with fill-you-up fiber, slow-digesting carbohydrates, protein, and antioxidants! The perfect recipe to enjoy before hitting the gym or as a quick & easy breakfast in the morning. 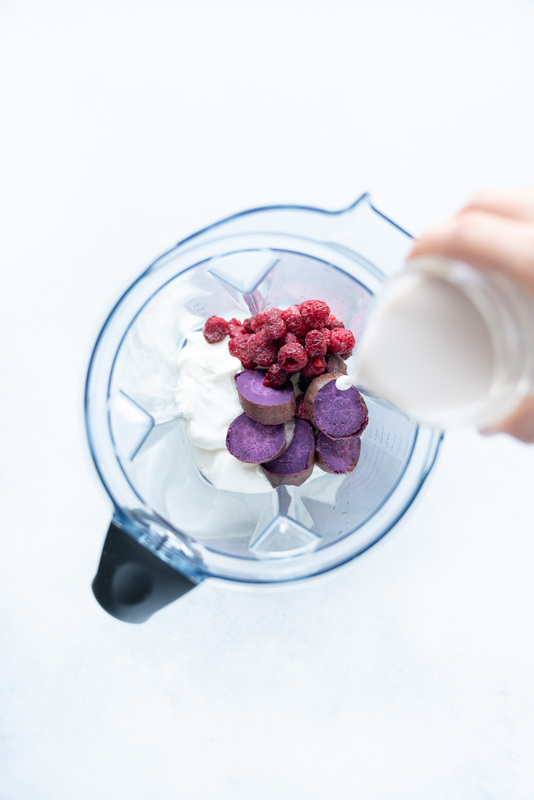 BLEND ALL INGREDIENTS: Layer ingredients into the blender (in order from easiest to hardest to blend to make it quicker and simpler for your blender to process) – almond milk, yogurt, lemon juice, vanilla extract, raspberries, sweet potato, and collagen (if using). Then sweeten to taste with natural sweetener of choice and blend until smooth. Enjoy immediately! *I used roasted purple sweet potato in this recipe but you could use orange or white sweet potatoes too. ** I used 15 drops of liquid stevia, but you can use any natural sweetener you like (for example agave, maple syrup, coconut nectar, honey, or 1-2 pitted dates). Preheat oven to 325. Drizzle a little cooking oil onto each potato and rub onto the skin until coated. Wrap in foil, place on a baking sheet, and roast for 1 hour and 30 minutes (or until the sweet potato is soft when you squeeze it). Let cool, cut into rounds and freeze. Preheat oven to 350. Prick each sweet potato several times with a fork (all over) or lightly pierce with a paring knife. Then wrap in foil, place on a baking sheet, and roast for 60 – 90 min (or until sweet potato is soft when you squeeze it). Let cool, cut into rounds, and freeze.